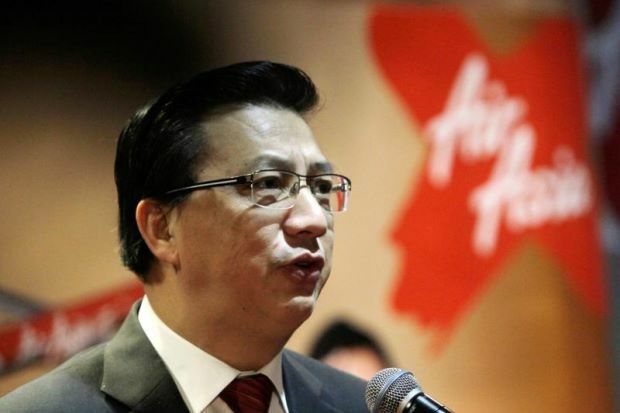 Why Liow & MAHB encouraged AirAsia to owe RM50 million PSC/Airport Tax? YB Datuk Seri Liow Tiong Lai, the MCA Minister of Transport. He is encouraging AirAsia to owe PSC/Airport Tax debt of more than RM50 million by not taking the necessary actions. Reliable sources have confirmed that AirAsia owed Passengers Service Charge (PSC) (formerly known as ‘Airport Tax’) of more than RM50 million to Malaysia Airport Holding Bhd (MAHB). Passenger Service Charge (PSC) is paid by departing passengers. The PSC is collected by the airlines upon purchase of tickets and is only paid to MAHB upon completion of the flight. Passengers who do not travel on the flight for which they have purchased the tickets are eligible for full refund for the PSC. Therefore, these passengers are advised to obtain the PSC refund from the respective airlines concerned. Please read HERE. This is not the first time that AirAsia owed PSC/Airport Tax. In 2010 AirAsia owed MAHB of about RM120 million in Airport Tax for more than 5 years. After the matter was brought to the attention of the 4th Floor Government in Parliament, AirAsia was compelled to pay the said outstanding airport tax. Instead of imposing an interest for the outstanding airport tax debt, AirAsia was granted by the 4th Floor Government a huge discount of about 25%. By right the 25% discount should have been passed on to the passengers who have paid for the Airport Tax. In this case, AirAsia benefitted from the said Airport Tax debt! In November 2011 the Ministry of Transport had confirmed that AirAsia had collected from no-show passengers totalling RM6.5 million and AirAsia X RM498,000 and both companies have not handed over the said sum to MAHB and/or returned to no-show passengers, HERE. Yours truly believes that up to this date the said PSC had not been refunded to the no-show passengers and/or paid to MAHB for safe-keeping. Despite having kept the said PSC, in December 2014 AirAsia had posted losses of RM429 million and AirAsia X RM650 million. 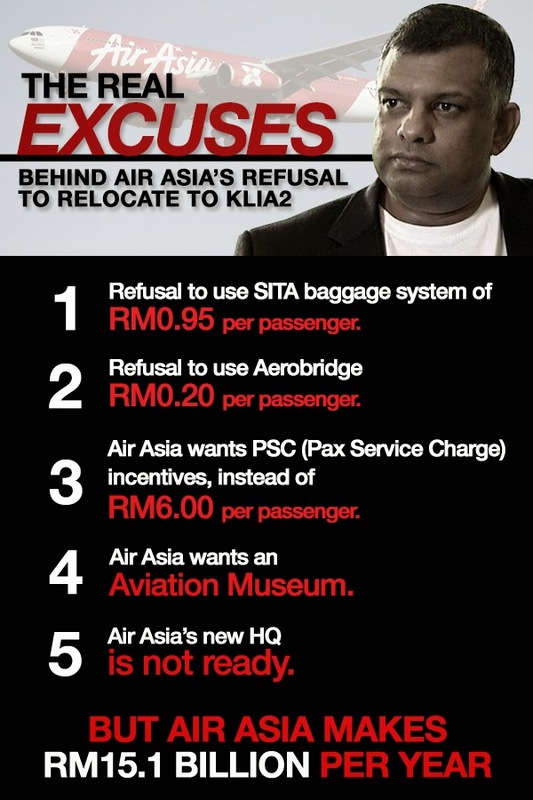 In March 2014 AirAsia saw it fit to arbitrarily imposed RM3 KLIA2 Fees on top of the PSC. For all the hidden charges imposed upon the passengers by AirAsia please read HERE. In January 2012 AirAsia owed a small sum of Airport Tax to Indonesian Airport Authority, its aircraft was not permitted to take off until full settlement of Airport Tax debt. Of course, AirAsia had no alternative but to settle the said outstanding Airport Tax in full, HERE. The real excuses. May be AirAsia treats the PSC as its profits! It boggles the minds why AirAsia was so daring to owe PSC/Airport Tax, refuse to move to KLIA2, refuse to use aerobridge and dictating terms to MAHB, HERE. By the way, in December 2014 AirAsia had posted losses of RM429 million and AirAsia X RM650 million and yet its CEO has been quoted to have said that AirAsia X intends to expand its service to Hawaii, London, Paris and etc, HERE. Why MAHB and the Ministers of Transport, Datuk Seri Liow Tiong Lai, are condoning and/or encouraging AirAsia to chalk up such huge outstanding PSC debt of more than RM50 million when AirAsia is supposed to pay to MAHB all PSC collected upon passengers departing from our airports? Next Why Is MAHB/Govt Allowing AirAsia To Bully Them? What do you expect from the ball-less Liow? Further, an MCA leader Dato Fam Lee Ee is also on the Board of Directors of AirAsia. So it should be clear to all why AirAsia is allowed to owe Rm50 million PSC debt. I understand that Richard Branson and Tony have been spotted together in posh hotels in the Golden Triangle of Kuala Lumpur within the past few months, including last week. Such meetings between Branson and the Pariah have no significance. The reason being that when an airline could not pay the PSC speaks volume of its cash flow. PSC are paid in advance by the passengers and to be paid over to MAB. There is no good reason for the low caste airline to hold on to it. Why MAB is not taking actions? In other countries, the low caste airline will be denied all facilities at the airport i.e. all landing rights will be suspended. Why is MAB not doing that? Why is the Minister of Transport keeping quiet? Is Liow another Chan Kong Choy for the Pariah? There is no doubt that the low caste airline is in deep financial problems now. So all investing public must be cautious in dealing with the Pariah and his outfits. Well our transport ministry and MAB are lame but it will be interesting to learn why Branson and Tony have been meeting in Malaysia recently. I expect that they will announce something soon. This is the face of the new Wall Street Economy. Profits are not made by the production of goods and services (Kena GST pula) but by commission and omission. This is what we bargained for when our government in 1984 promoted this close working relationship between the Public and private sector..
Economists such as Frederick List and Karl Marx believed that the wealth of nations is measured by the production of goods and services which are of value to society but the economists who hold sway today tend to regard the levels of consumption and speculation are the measures of wealth and we can see where that is leading today. What can Branson do when the AirAsia losses stand at RM430 million without taking account all the other debts and AirAsia X RM650 million losses! AirAsia has been living on forward ticket sales and the sales are not good. It is facing competition from MAS, Malindo, Firefly, Tiger Air and many others. The bubble is going to burst soon. No other airlines dare to owe PSC/airport tax except this low caste. It is protected by this useless MCA Minister the Mr Habis Liow! MAHB is managed by a bunch of idiots only good in taking instructions not to take actions against the low caste. I was just curious why Branson has been seen together with Tony in KL recently and now realise that it could have something to do with these planned listings of their Indonesia and Philippines units. Of course, whether the listing goes through next year is left to be seen. Quite frankly, I find it rather crazy for them to rely on forward ticket sales in face of an uncertain global economy and competition. It is a sad case for MAHB. It is not carrying out its duties properly or it has been instructed by the little napoleons in Khazanah to take it easy with AirAsia. We know that the low caste is a close friend of the top dogs in khazanah. We also know that AirAsia is suffering badly from its cash flow. It is owing many creditors. However, this is not a criteria for MAHB not to take actions to recover the PSC. In fact, it is very easy for MAHB to recover. All it needs to do is to withdraw all airport facilities from AirAsia like what the Indonesian had done to it. Why is AirAsia not owing PSC in other countries? It is because it knows that the foreign airport authorities will not tolerate their nonsense and will not allow its aircraft to land or take off unless it settle all outstanding PSC. We hope that the dunggus in MAHB and the ball-less Minister of Transport will wake up and stop giving special treatments to AIrAsia. The govt should take actions against the officers in MAB and Ministry of Transport for allowing AirAsia to owe PSC. They should be sacked including the CEO. It would appear that the CEO of MAHB is closing one eye on this debt. I am wondering what is he getting out of this. The MACC should move in to do a thorough investigation into this matter. No CEO of a company will let a company using its facilities and collected all the fees and did not hand over the collection. This only happen to MAB that is run by the dunggus. It is very obvious that AirAsia is having cash flow problems. So beware. AirAsia suffered huge losses and needed the cash for its survival. What better than keeping the PSC! when pay back in a few years time then the stupid government and MAB would grant a big discount. Not a bad deal after all interest free loan and rewarded with a discount. Other airlines should follow the footsteps of AirAsia and lets see what will happen to MAB. The ball-less Liow has been seen to be a closed friend of Tony. Liow is learning to be another Chan Kong Choy, the ex-Minister of Transport. During the time when Chan Kong Choy was the MOT, the Ministry was a second home to Tony. It was also during that time that Tony and AirAsia were given special preferences over MAS. We are observing you Ball-less Liow. The top management of MAB must be held accountable for not collecting the PSC. The CEO of MAB ought to be made to pay the interest for the outstanding PSC owed by AirAsia. The govt must put an end to this “tidak apa” attitude of MAB. That is the difference between M’sia and our neighbour’s…Singapore.. Imagine what will happen if SIA owes the Govt the PSC!! Only here in the Bolehland you could see our PM “snakehand” with the Crooked TF during the Invest 2015…. Owing of PSC will never happened because it will not be tolerated by the authorities. Unlike in Malaysia the little napoleons in Khazanah and MAHB are corrupted to the extent of closing their eyes. This is the problem in Malaysia. There is no good reason for MAB not to withdraw all airport facilities including take off and landing to AirAsia until full payment of PSC with interest. As long as such drastic actions are taken, AirAsia will carry on to keep PSC as its profits. The government must take actions against the little napoleons in Khazanah and MAHB. They are showing bad examples internationally. It is just incredible that the little napoleons in MAHB still “degil” and refuse to admit its glaring mistake to allow AirAsia to owe more so many million. My info tells me that the debt is about RM80 million. The government must take strong actions against these little napoleons otherwise soon AirAsia’s PSC debt will reach RM150 million. The CEO (Badulhisham) of MAHB should be sacked for not carrying his duties properly. Enough is enough. Someone must be held accountable for this huge debt that should not have been allowed to accumulate in the first place. I believe that the top management of MAB are involved with corrupt practices otherwise Airasia wouldn’t to be able to owe RM80 million. In Jakarta AirAsia owed ten of thousand RM and its aircraft got grounded until full settlement. AIrAsia immediately settle it in cash. The dunggus in MAB: No other airport authorities in the world have allowed an airline to owe mRM80 million PSC except MAB. I can’t help but to think that the officer must have been greased to close their eyes about this debt otherwise there is no way AirAsia’s PSC debt could reach RM80 million. It must be more than a year. The CEO of MAB should be thrown into the long kang. Some of you may want to know about Liow Tiong Lai. He is a useless MCA Minister. ; Good for nothing and ball-less as have been correctly described by other readers. Until now the MAB’s dunggus are still keeping their silence on the AirAsia’s PSC debt. The CEO of MAB should be sacked for allowing AirAsia to accumulate so much PSC debts. Until now there is no positive actions taken against AIrAsia for not paying up the PSC. I don’t understand why MAB fear the low caste airlines. May be its officers have been receiving ….